”I shoot b-roll of players/fans during practices and games, and locker room interviews with players. I run the camera for post-game press conferences with Head Coach Mike Sullivan. I also get to go out in the field for events, which is fun. 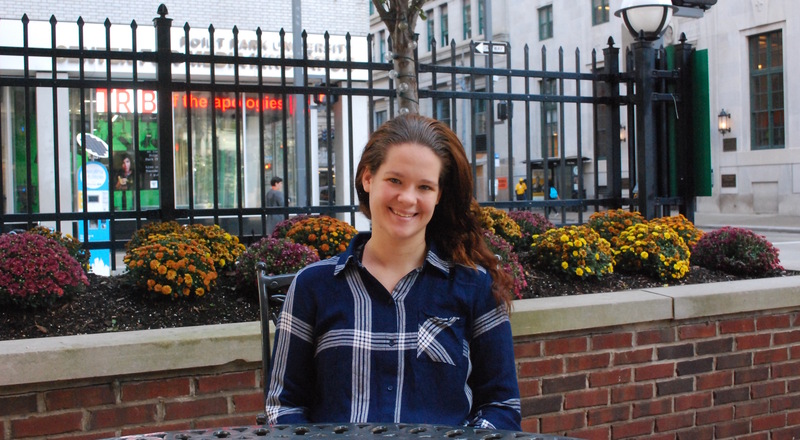 I got this internship through work with Point Park, which is really exciting for future students!" I chose Point Park for the small class sizes and because it is in the city. It’s really nice that we have the opportunity to build connections and gain job experience right in the community that is our campus. Tell us about your internship with the Pittsburgh Penguins. I am a production intern with two other Point Park students! It’s a really cool environment where I am getting hands-on experience. I shoot b-roll of players/fans during practices and games, and locker room interviews with players. I run the camera for post-game press conferences with Head Coach Mike Sullivan. I also get to go out in the field for events, which is fun. I got this internship through work with Point Park, which is really exciting for future students! How have your extracurricular experiences helped you land internships? My extracurricular experiences with U-View, WPPJ, the Center for Sports Media and Marketing and the Society for Professional Journalists have had a critical role in helping me land internships. These organizations have allowed me to gain positive experiences, which have developed into detailed resumes and, in turn, cool internships. Where is your favorite place to hangout in the city? I like going out to Point State Park to relax and see some grass in our concrete city. I also enjoy going on walks throughout the city. It makes me more familiar with my surroundings and truly makes Pittsburgh feel like home. Who makes the best pizza in Pittsburgh? My favorite pizza in the city by far has to be Genoa’s buffalo chicken pie with extra, extra ranch. One night during finals week, I went out with my friends and boyfriend Denis and this pizza pie was amazing. Anytime I get pizza I always get Genoa’s buffalo chicken with breadsticks. To incoming students, I say get involved if it’s the last thing you do! Being involved on campus has allowed me to have so many positives experiences with both my peers and professors. I've gained access to many networking opportunities that have led to valuable opportunities for me. I have thoroughly enjoyed getting to know my peers and so many professionals in the city, and I have Point Park to thank for that!